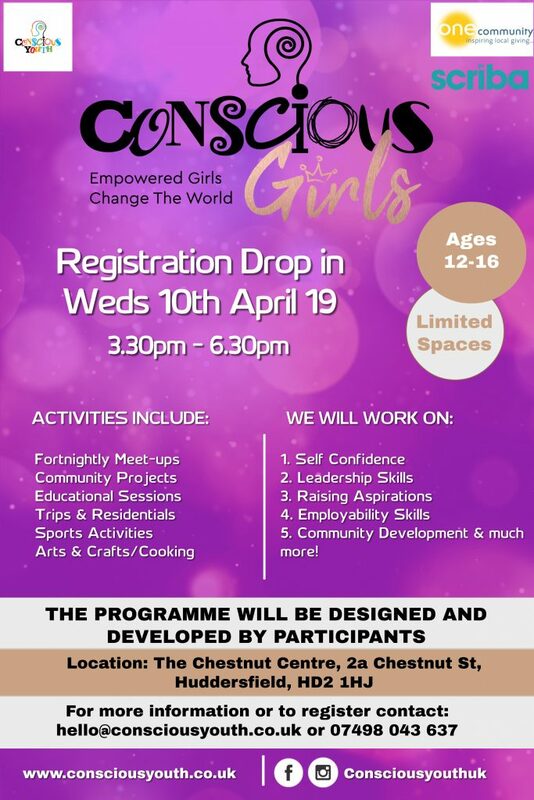 Conscious Youth CIC is proud to announce that following the success of our Kicks Vs Conscious Youth Sessions and the commitment of our volunteers we are now taking new registrations for our new initiative ‘Conscious Girls’ – Girls youth forum. The project is designed to address specific disadvantages suffered by young women from different social and cultural backgrounds in Kirklees. The Conscious Girls Youth Forum is an excellent platform for girls aged between 12-16 years to come together, discuss and explore topics which impact on them and address local issues. The forum’s primary aim will be to identify and address the social and economic needs of young women growing up in our communities. The project officer and volunteers will mentor and support participants to overcome barriers and to understand and accept who they are as individuals. The project aims to raise self-confidence, aspirations and nurture leadership qualities through various activities, campaigns and community projects. For more information on our Conscious Girls Youth Forum see the poster.